Data Privacy Liabilities and Different Software Delivery Models: How to Stay on the Safe Side? Web analytics has become an essential tool for companies seeking to build a comprehensive profile of their customer base. However, obtaining insights on individuals should be done within the boundaries of legal obligations, ethical considerations and customer expectations. Your data privacy liabilities will depend greatly on the software delivery model your company deploys. Since trust is key in this equation, it is worth knowing how your digital setup type impacts the measures you should take to protect your users’ information. That is why in this post we will discuss different types of software delivery models with their corresponding data privacy liabilities and recommendations on risk reduction. We will start with software as a service (SaaS), as it has become the standard for business applications in recent years. Then we will briefly discuss how the on-premises model differs in terms of data privacy liabilities management and what this means for your organization. 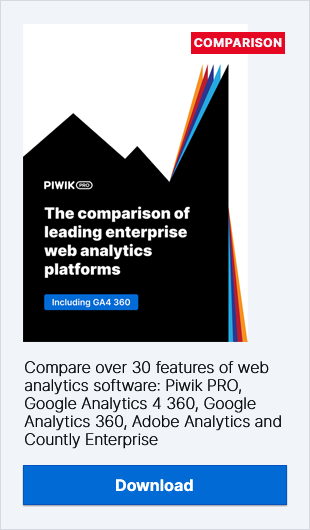 Just like other digital industries, web analytics as well has moved to the SaaS model for a number of reasons. First of all, cloud solutions tend to be more affordable. On the vendor side, they are also easier to manage, as one-size-fits-all packages limit upgrade issues. This type of solution is also easier to scale. Apart from SaaS, there are also the related cloud-hosted categories of IaaS (Infrastructure as a Service) and PaaS (Platform as a Service). However, whichever type you use, responsibility for the data uploaded into the cloud remains with the tenant, that is the solution user or subscriber. This will be governed by the terms and conditions of your chosen solution, so your first move should be to read the small print carefully. In a perfect world, there would be one template of T&Cs for all cloud-hosted web analytics solutions. Unfortunately, these types of offerings often suffer from non-transparent, unclear and diversified clauses. Opaque terms and conditions can lead to tensions with your legal department, as every word is crucial. If they lack precision or are written incorrectly, the consequences of individual clauses can be serious. Quite logically, SaaS providers try to limit their liability within the data ecosystem. That is why it is normal for their terms and conditions to include what types of data are accepted. It impacts security measures and related costs. The more sensitive the data is, the more prone to attacks it becomes, so more resources need to be dedicated to protection. That is why clauses that forbid uploading personal or sensitive information are not uncommon. These limitations are often evaded through anonymisation techniques, attributing unique IDs, partial hashing, or tokenisation. Yet, these methods are not perfect. They still call for adequate processes to ensure that T&Cs are respected, including proper security measures for data transfers. Additionally, terms and conditions of cloud-hosted services evolve. This can also impact the way you use such platforms. For instance, it has been about a year now since the renouncement of Safe Harbor and the introduction of Privacy Shield. These two agreements on transnational personal data transfers have also influenced the usage of some of the most popular marketing and analytics platforms. Companies using SaaS solutions need to keep abreast of evolving T&Cs. It influences the way they do business and should be part of a comprehensive data governance plan. Luckily, cloud-hosted vendors have understood that privacy functionalities are of interest to their clients, so they are introducing such tools with greater frequency. However, it is worth pointing out that SaaS solutions dictate the range of features that can be offered. This means that privacy settings provided in a cloud-hosted solution might not always be suitable to particular requirements or contexts. Add to that the tension stemming from conflicting views on privacy between European and US vendors, and you can see that management of data privacy liability can be challenging at times. Last but not least, despite their seemingly intangible appearance, cloud-based solutions are always physically hosted in a certain location. It is crucial that you know where your data is stored as it falls under the jurisdiction of one specific place, country or region of the world with its own sovereignty and laws. We recommend closely reading the terms of service offered by prospective vendors and choosing a solution that will not compromise your data ownership and privacy. If you are not sure about some of the clauses included, seek legal counsel. Remember that you can ask your software provider for written assurance that your data will remain fully in your control, and that the vendor will not use it for any other purpose than providing the service, nor share it with any other parties. Always ask for detailed information on the location of the infrastructure which holds your analytics data. If possible, choose solutions that are stored in countries with similar privacy regulations as the regions where your clients are based. For instance, if you mainly cater to Europeans, choose a cloud service located within the European Union. This way you will ensure a uniform and compliant approach to data privacy and protection. On-premises is no longer the prevailing model. The takeover of self-hosted Urchin by Google released an avalanche, with more and more web tracking vendors gradually discontinuing their on-premises tools and switching to “the cloud” for cost efficiency, convenience and scalability. In spite of the dangers, there are still people using old, unupdated versions of discontinued software. Is this just because of sentimental attitudes towards on-premises tools? Maybe, but self-hosting makes managing data privacy liabilities easier than in the case of SaaS solutions, which is also of value. This is something that organizations dealing with sensitive information really need to take into consideration to abide by their industry regulations. First of all, there is no problem with changing terms and conditions of service. By keeping your analytics software and data on your infrastructure it is you, and nobody else, who decides how, where, and under which conditions your customer information is stored. If you use a self-hosted tool you are not obliged to accept updated versions of TOS which may violate your internal regulations or fail to meet your requirements. And unlike in SaaS agreements, there are no limitations as to what kind of information may or may not be uploaded and processed. Your clients and partners are assured that their sensitive data is protected, as only you have access to it. Since it stays on your servers, there is no risk of accidental data leaks or security threats. For many governments and enterprises, this kind of guarantee is key. Analogically, with on-premises solutions there is no need to ascertain the exact location of cloud-hosted data. You know that your data is not shared with any third parties or sent to be processed anywhere else, for instance to regions where privacy standards may not meet your clients’ expectations. Additionally, self-hosting helps to minimize privacy risks, as context-specific requirements can be rolled out and supported within your organization. Having a self-hosted tool provides companies with a way to tweak and configure specific elements in order to create a tool tailored precisely to the their needs. On-premises solutions can make your data privacy liabilities management easier, but at the same time they require resources for self-hosting not every organization may have access to. In such cases, contracting external on-premises analytics experts can be a good step, especially for companies and governments dealing with sensitive data on a daily basis. As you can see, the delivery model of your web analytics software has a huge impact on your data privacy liability. Of course, we will not try to argue that one type of deployment is better than any other. There is no one-size-fits-all answer. Yet it is important to keep in mind that the model you choose may require additional measures to reduce privacy risks, so make an effort to take all necessary precautions in advance. Content marketing & PR manager @ Piwik PRO. An avid enthusiast of all things digital, MA in Digital Media from Goldsmiths, London. Digital Analytics Privacy: A Never-Ending Conundrum?